The condition of Christian humanity with its fortresses, cannons, dynamite, guns, torpedoes, prisons, gallows, churches, factories, customs offices, and palaces is really terrible. But still cannons and guns will not fire them­selves, prisons will not shut men up of themselves, gallows will not hang them, churches will not delude them, nor customs offices hinder them, and palaces and factories are not built nor kept up of themselves. All those things are the work of men. If men come to understand that they ought not to do these things, then they will cease to be. And already they are beginning to understand it. Though all do not understand it yet, the advanced guard understand and the rest will follow them. And the advanced guard cannot cease to understand what they have once understood; and what they understand the rest not only can but must inevitably understand hereafter. 요새들, 대포들, 다이너마이트, 총들, 어뢰들, 감옥득, 교수대들, 교회들, 공장들, 세관들, 그리고 궁전들을 가진 기독교적인 인류의 상황은 진실로 무섭다. 그러나 아직도 대포들과 총들은 스스로 그들에게 쏘지 않을 것이며, 감옥들은 스스로 사람들을 가두지 않을 것이며, 교수대가 그들을 매지 않을 것이고, 교회들이 그들을 속이지 않을 것이며, 어떤 세관도 그들을 방해하지 않으며, 궁전들과 공장들이 스스로 세우고 유지되지 않을 것이다. 그 모든 것들은 사람들의 작품이다. 사람들이 이런 일들을 해서는 안된다는 것을 깨닫는다면, 그들은 멈출 것이다. 그리고 이미 그들은 그것을 깨닫기 시작하고 있다. 비록 아직 모두가 그것을 깨닫지는 않지만, 앞서 가는 사람들은 깨달으며, 나머지는 그들 뒤를 따를 것이다. 그리고 앞서 가는 사람들은 일단 깨달은 것을 깨닫기를 중단할 수 없다; 그리고 그들이 깨달을 것을 나머지 사람들은 앞으로 필연적으로 깨달을 수 있을 뿐만 아니라 반드시 깨달아야 한다. So that the prophecy that the time will come when men will be taught of God, will learn war no more, will beat their swords into plowshares and their spears into reaping-hooks, which means, translating it into our language, the fortresses, prisons, barracks, palaces, and churches will remain empty, and all the gibbets and guns and cannons will be left unused, is no longer a dream, but the definite new form of life to which mankind is approaching with ever-increasing rapidity. 그래서, 사람들이 하나님에 대해서 가르침 받고, 더 이상 전쟁을 배우지 않으며, 그들의 칼들을 쳐서 쟁기로 만들며, 그들의 창은 곡식용 낫으로 만드는 때가 올것이라는 예언은, 이것을 우리의 언어로 번역하자면, 요새들, 감옥들, 병영들, 궁전들, 그리고 교회들이 비워지며, 모든 교수대와 총들과 대포들이 사용되지 않음을 의미하는 것으로서, 더 이상 꿈이 아니라 계속 증가하는 속도로 인류가 다가가는 확실한 새로운 삶의 형태이다. Eighteen hundred years ago to this question Christ answered that the end of the world (that is, of the pagan organization of life) shall come when the tribulation of men is greater than it has ever been, and when the Gospel of the kingdom of God, that is, the possibility of a new organ­ization of life, shall be preached in the world unto all nations. (Matt. xxiv. 3-28.) But of that day and hour knowetn no man but the Father only (Matt. xxiv. 3-6), said Christ. For it may come any time, in such an hour as ye think not. 1800년 전에 이 질문에 대해서 그리스도는, 세상의 끝 (즉, 이교적 삶의 조직의 끝)은 사람들의 시련이 이때 까지 있어온 것보다 클 때, 그리고 하나님의 왕국의 복음이, 즉, 새로운 삶의 조직의 가능성이 세상에서 모든 민족들에게 전파될 때에 (마태복음 24장 3-28절) 올 것이라고 대답했다. 그러나 그 날과 시간은 누구에게도 알려지지 않았으며 오직 아버지만 아신다 (마태복음 24장 3-6절)고 그리스도는 말했다. 왜냐하면 그것은 당신들이 생각하지 못하는 그런 때에 언제든지 올 것이기 때문이다. And there could be no answer but this one. Men can­not know when the day and the hour of the kingdom of God will come, because its coming depends on themselves alone. 그리고 이것 말고는 어떤 대답도 있을 수 없다. 사람들은 하나님의 왕국이 올 날과 시간을 알 수 없다, 왜냐하면 그 오는 날은 오직 스스로에게 달려 있기 때문이다. The answer is like that of the wise man who, when asked whether it was far to the town, answered, "Walk!" 그 대답은 마치, 마을에서 멀리 떨어져 있는지 물어 왔을 때, “걸어라!”라고 대답한 현명한 사람의 대답과 같다. How can we tell whether it is far to the goal which humanity is approaching, when we do not know how men are going toward it, while it depends on them whether they go or do not go, stand still, slacken their pace or hasten it? 사람들이 어떻게 그곳으로 가고 있는지 모를 때, 그들이 가는지, 아니 가는지, 가만히 서있는지, 걸음이 느려지는지 서두르는지가 그들에게 달려 있는데, 인류가 다가가고 있는 목적에 얼마나 가까이 와 있는지, 우리가 어떻게 말할 수가 있는가? All we can know is what we who make up mankind ought to do, and not to do, to bring about the coming of the kingdom of God. And that we all know. And we need only each begin to do what we ought to do, we need only each live with all the light that is in us, to bring about at once the promised kingdom of God to which every man's heart is yearning. 우리가 알 수 있는 모든 것은, 인류를 구성하는 우리가, 하나님의 왕국의 도래를 이룩하기 위해서, 반드시 해야 하는 것, 그리고 해서는 안되는 것이다. 그리고 우리 모두는 그것을 안다. 그리고 모든 사람의 가슴이 염원하는 약속된 하나님의 왕국이 당장 이룩되려면, 우리는 오직 각자가 우리가 해야 하는 것을 행하기 시작해야 할 필요가 있으며, 우리는 오직 우리 안에 있는 모든 빛과 함께 살 필요가 있다. American folk artist Edward Hicks, also a Quaker preacher, often painted religious themes. 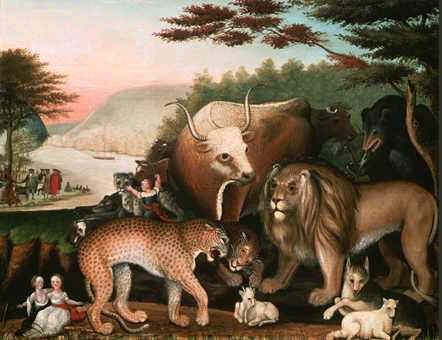 He painted many versions of Peaceable Kingdom, which illustrates an Old Testament prophecy predicting peace and gentleness between all creatures. This version was painted between 1844 and 1845.